Ranges to suit all requirements. Garden Dining Sets - Inlay Spain. The Inlay Garden Dining Set is made from white aluminium. The table is available in a 220cm rectangular size. 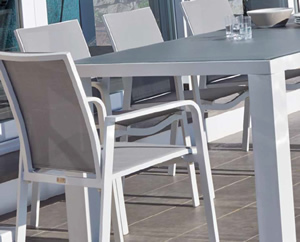 This table is built to be long lasting white aluminium making it easy to clean. It will guarentee to make any terrace or garden space look very stylish indeed. Contact Us For Best Deals.